Some say the hardest part of learning how to ride a bike is the pavement. The second hardest may be convincing the world to reconsider this time-tested form of transportation as a new leap forward for environmental sustainability. Bikes are 100% environment-friendly, fully air-conditioned, and enjoyed at a low cost both in developing and developed countries. On a hot, sunny day in June, a UN bike ride was held at the UN Headquarters in New York to promote cycling as a sustainable means of transport in the lead up to Rio+20 – the UN Conference on Sustainable Development. 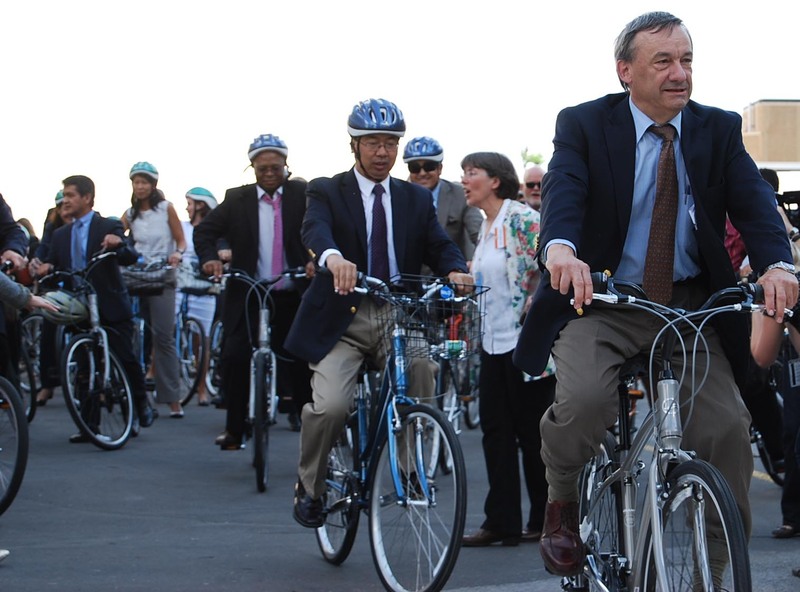 It’s not only the masses that love to ride bikes – UN Secretary-General Ban Ki-moon and over 40 ambassadors and dignitaries participated in the cycling. 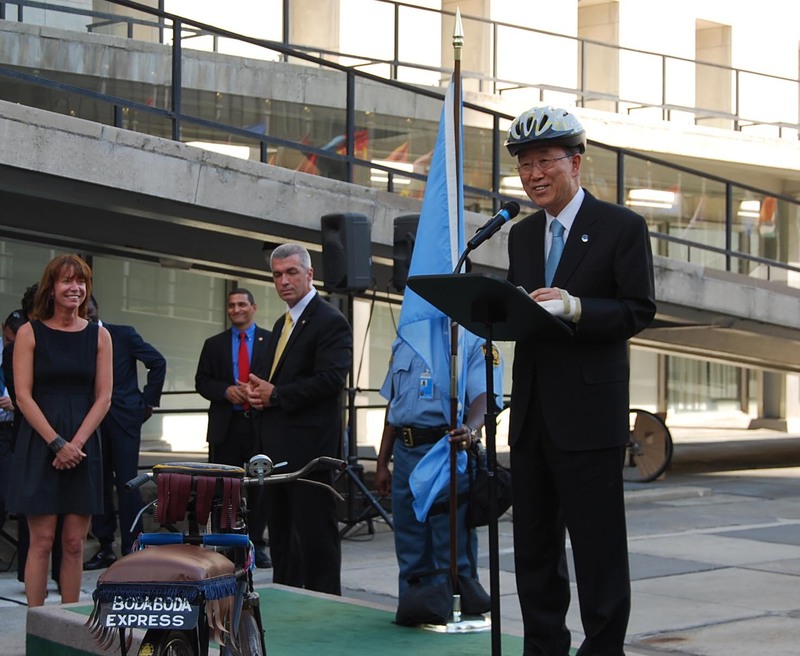 Although the Secretary-General couldn’t actually ride because of a broken arm, he got into the spirit of things by wearing a helmet during his speech, sharing stories of riding a bicycle in his youth, during the poverty-stricken days of South Korea. “I would much rather see bicycles and bike-riders around here than the limousines, armored SUVs and other gas-guzzling cars that we all use at the United Nations,” the Secretary-General said. Then he went on to suggest that ambassadors and Heads of State to use bikes during the General Assembly season. It might not be feasible, but it was a refreshing suggestion. 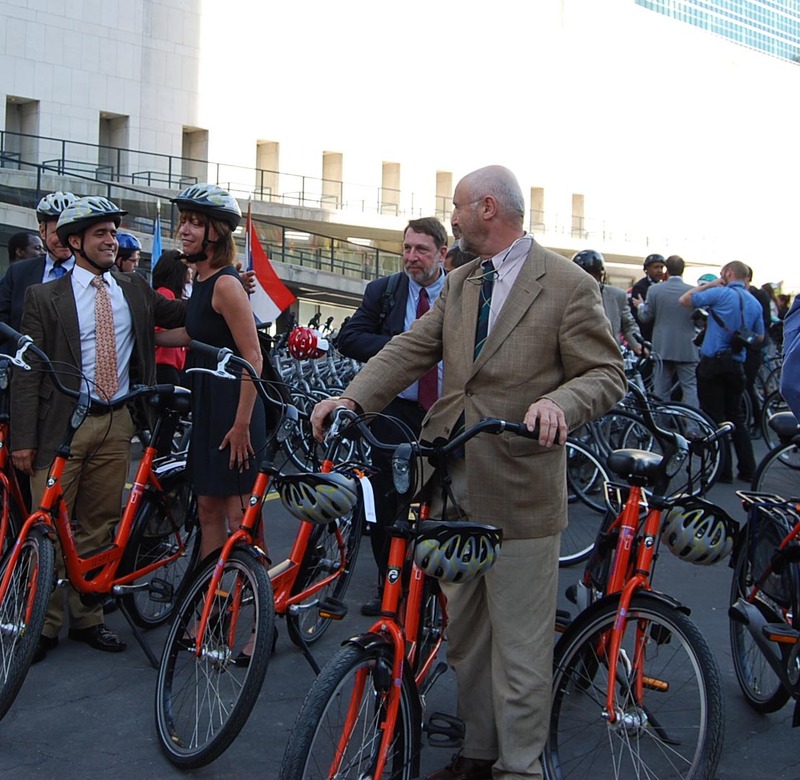 The Commissioner of the New York City Department of Transportation, Janette Sadik-Khan – a key player in Mayor Michael Bloomberg’s efforts to transform New York into a greener city – also took part, saying that NYC has donated 100 bikes to the UN (thank you, New York!). Sadik-Khan and her team have been working to reduce 30% of the city’s carbon footprint by the year 2030, providing protected bike lanes or segregated cycle facilities.